I managed to get two more UFO finishes done this April if i can keep going at two a month I will knock quite a big hole in my UFO list. I started a weekly sewing group and this has helped me keep some time aside to get my UFO's done. Firstly this table runner has been designed (by me) and waiting to be sewn together for a few years. I used an Authentic by Sweetwater charm pack and have enough left to make a 2nd table runner. These hand towels are the last of the pile I started on last year. Two of these are heading off to Shirley as part of a swap, she made me some dish cloths and these hand towels are in return. Went to a baby shower today for my nephew and his wife. 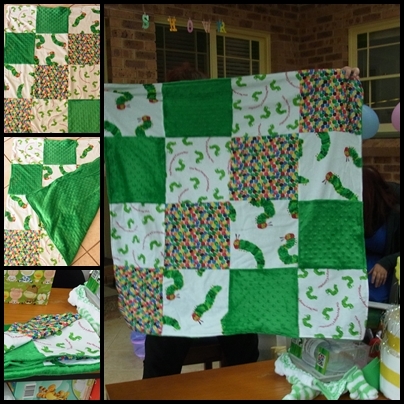 I decided to make them a Very hungry caterpillar kick rug to go with a few other VHC items. It turns out she loves green and VHC was one of her favourite books. The Friday night sewing is proving to be very productive. Lovely work. VHC is so cute! So many lovely finishes! Great job.